Rather than share another Christmas decoration, tonight I thought I would share a couple of flowers from my garden. I do not have a green thumb at all, but this time of the year something happens and the plants take care of themselves. This beautiful mauve rose is called "Blue Moon". It is Shane's latest pride and joy. I just bought the orange daisies and put them into a black pot and they look OK. As for the delicate blue flower - I have no idea what it is - it just came up and surprised me. I love blue moon, it has the most divine fragrance... i dont know the blue flower either, its petals remind me of a ballroom dancer. Wow, beautiful flowers! I can't help but be amazed, as all of our flowers and grass sleep for the winter, your flowers are in bloom and looking heavenly! Do you get any snow at all during the year or is it nice the whole year through? A mauve flower called "Blue Moon" - very Australian!! The rose, an unusual shade of colour for a rose but very lovely. 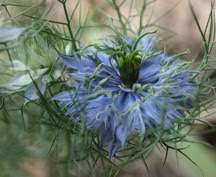 The other blue flower is called 'Nigella'.